ENSENADA, Mexico—While SCORE Trophy Truck qualifying determined the starting order for the marquee racing division, the start draw for starting positions for all the other classes was held in Las Vegas this week for the upcoming 50th annual BFGoodrich Tires SCORE Baja 1000, the iconic Granddaddy of all desert races. To date 381 entries have been processed with racers coming from 42 U.S. States, two U.S. Territories and 25 total countries. Racers continue pre-running on their golden quest over the rugged 1,134.40-mile race course all the way down Mexico’s majestically magnificent Baja California Peninsula. The start draw was held on Wednesday in conjunction with the SEMA SCORE Baja 1000 Experience that was part of the week-long SEMA Show at the Las Vegas Convention Center. Advance on-line racer-registration continues until 5 p.m. (PT) on Wednesday (Nov. 8) at www.score-international.com for this year’s legendary competition. The event and race-week festivities will be held Nov. 12-18 in Baja California, Mexico. Commemorating the first race, motorcycle and quad classes will start at midnight (PT) on Wednesday, Nov. 15 and the car, truck and UTV classes will begin their journey in the elapsed-time race 10 hours later at 10 a.m. (PT) on Thursday, Nov. 16. While the fastest vehicles are expected to complete the course in approximately 19 hours, all vehicles will have 48 hours from the time each starts to complete the course and become an official finisher of the 50th anniversary race. To date, there are 381 total entries from 42 U.S. States, two U.S. Territories and 25 countries officially signed up to compete. In addition to the United States, the U.S. Territories of Guam and Puerto Rico and host country Mexico, the other countries with racers entered to date are Argentina, Australia, Austria, Brazil, Belgium, Canada, Chile, Costa Rica, England, Finland, France, Germany, Guatemala, Hungary, India, Israel, Italy, Japan, Monaco, New Zealand, Peru, South Africa and Spain. Including SCORE Trophy Truck (41), 12 total classes already have double figures in terms of entries so far. While several other classes have nearly reached at least 10 entries, the other classes with double figure entries to date are: Class 10 (30), Trophy Truck Spec (26), Pro UTV FI (25), unlimited Class 1 (20), Pro Moto Ironman (18), Class 1/2-1600 (17), Pro UTV (16), Baja Challenge (12), Class 7 (10), Class 5-1600 (10) and leading the Sportsman classes is SPT M/C with 25 entries so far. Gordon finished just .47 of a second faster than the runner-up qualifier as 12 of the SCORE Trophy Truck qualifiers finished the course in less than three minutes. Second was Las Vegas’ Rob MacCachren in the No. 11 Rockstar MacCachren Motorsports Ford F-150. MacCachren, the off-road Hall of Famer who has five overall victories in the SCORE Baja 1000 has won the last three consecutive SCORE Baja 1000 races. Racer registration will be held in the Red Room at the Riviera del Pacifico Cultural Center in Ensenada. Racer registration will be held from noon to 5 p.m. (PT) on Sunday (Nov. 12), from 10 a.m. to 8 p.m. (PT) on Monday (Nov. 13), from 9 a.m. to 4 p.m. (PT) on Tuesday (Nov. 14) and 9 a.m. to 4 p.m. (PT) on Wednesday (Nov. 15). In La Paz, media registration will be held in the Emperor’s Ballroom at the Grand Plaza Hotel from 11 a.m. to 5 p.m. on Wednesday, Nov. 15 and the BFGoodrich Tires/Baja California Secretary of Tourism SCORE Media Center will be open on race days from 10 a.m. (PT) on Thursday, Nov. 16 until 4 p.m. (PT) on Saturday, Nov. 18. As the celebration continues Thursday (Nov. 15) night to all day and evening on Friday and on the morning of Saturday (Nov. 18) in La Paz while official finishers cross the line and tales and epic accomplishments are added to the legacy of the event. The post-race awards fiesta will be held in La Paz starting at 7 p.m. (PT) on Saturday (Nov. 18). 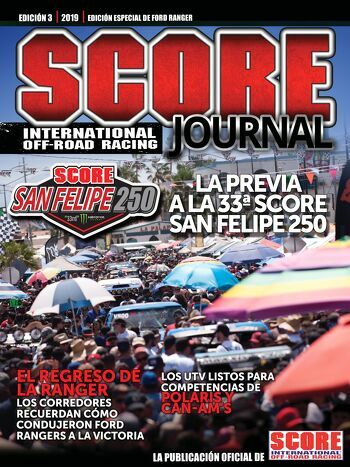 As it has for over four decades, SCORE has put together another memorable race course for the 50th anniversary, this one is a point-to-point race, with all of the foreboding, unforgiving terrain that both the northern state and southern state of the majestic Baja California peninsula has to offer. SCORE CEO/president Roger Norman and SCORE Race Director Jose A. Grijalva have designed and finalized this year’s race course of 1,134.40 miles. This year’s golden course will have five physical checkpoints along the way to the finish, 149 virtual checkpoints and 20 speedzones.